If you are photography artist and have a huge collection then it’s time share your artworks around the world.Today almost all photographers have a creative website or a WordPress blog and they showcase their photographs with their audience. Well,today we are bringing together an amazing collection of WordPress photography themes for you.As you see,most the photography themes are in full screen style which is really trendy nowadays. Here is the collection of 60 best WordPress Photography themes that we have handpicked for you. Raw WordPress Theme is a fully responsive HTML5 theme that is ideal for photographers, agencies and creative freelancers.It offers several homepage layout options, full and fixed width portfolio grids, awesome hover effects, full width sliders with HTML5 background video & touch support, fashionable captions, contact form with honeypot spam prevention and tons of professional styling options. LENS is a surprising premium WordPress theme aimed at photographers in need for a solution that focuses on what matters most to them: their work. Every feature was carefully chosen and designed to ease the way to that perfect photography portfolio website.Packed with a stunning yet minimal,flat design, LENS features fullscreen slideshows and galleries, grid based photo galleries and a journal to help photographers keep up with their visions and thoughts. Tripod is a responsive drag-and-drop layout builder WordPress theme intended to power professional photographers blogs or sites coming with complex image gallery options.You can use the template builder to display any content type you wish on any page: category posts, tags, banners, team groups, testimonials, latest or featured post, widgets, even individual posts. 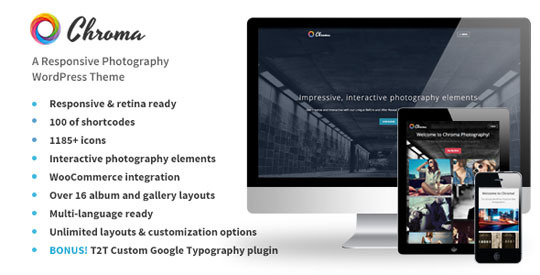 Chroma is a responsive, retina-ready, photography and multi-purpose WordPress theme.Chroma boasts an impressive set of unique features and powerful customizations options focused on showcasing your work in unique and endless ways. Unlimited page layouts, interactive elements, granular customization control and intelligent, modular shortcodes give you the power to create anything you can imagine quickly and easily. Photogra is perfect for photographer, creative agency or any kind of business to show off works/portfolio. With responsive design it’s compatible with almost all device from desktop to mobile. Ablaze from Spacehead Concepts is a unique, fullscreen and responsive portfolio theme for WordPress – perfect for the creative minded. Your photos, video and content are brilliantly displayed in an intuitive and minimal design, allowing you to boast to the world just how beautiful your work really is. 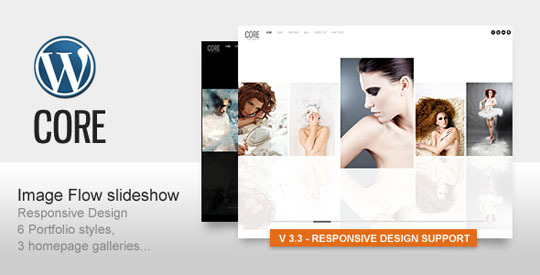 Digon is a highly customizable responsive fullscreen studio theme which which features fullwidth and 2 column postformat posts. Fullscreen, portfolio and pages can be password protected. Exposure is a slick theme for photographers with up to seven portfolio variations and with both masonry or carousel views. Expo is a creative agency, photography and restaurant WordPress theme. It’s designed with mobile-first practices in mind. Enjoy unique and modern design style developed with todays most effective coding techniques. A different premium WordPress theme for Photographers.The web-site is created using ajax, in this way every page is loaded without refreshing the browser. The template has a nice transition when chaning paging which will make your web-site a lot more different than the majority of existing templates. If you are searching something different and out of the line, please check out Pulsar – Fully Responsive Parallax WordPress Theme. Pulsar is a fully configurable and easy to use WordPress parallax theme with a lot of great features. It has been specifically designed to be easily customized and it’s created for creatives who want to make portfolio in minutes. Forte is a powerful, elegant and flexible WordPress e-commerce theme with an adaptive layout and many features inside. It has got a (really) powerful admin panel, and an intuitive page builder (page composer).Forte supports WooCommerce,WP Super Cache, WPMU (WordPress Multi-User or WordPress Network), and WPML, only to name the most famous ones. Invictus is a Fullscreen Image and Video WordPress Theme for photographer or creatives.Invictus is so easy to use, super versatile and has a fully responsive design! With it’s flexible theme, page and post options Invictus is very intuitive to use and completely ready to operate out of the box. Artboard is a full screen portfolio theme + a full featured blog that leverages the best that WordPress has to offer.